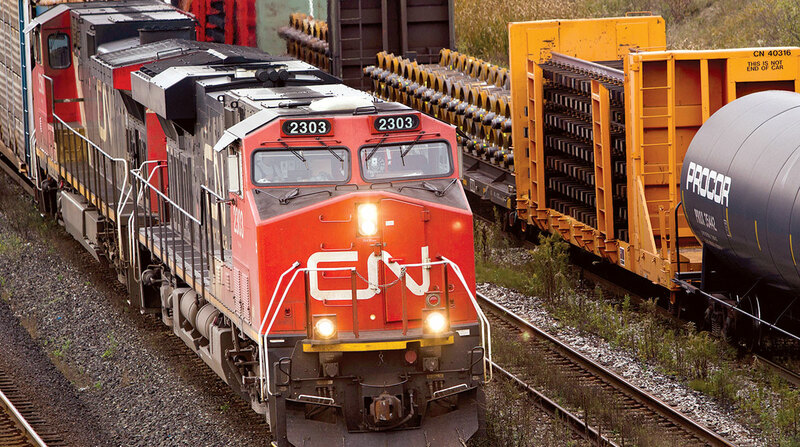 Just hours after being officially named by its Board of Directors as the new president and CEO of Montreal-based CN Railroad, Jean-Jacques Ruest presented an improving financial picture when the company’s second-quarter results were released July 24. On a conference call with reporters and financial analysts, Ruest said CN’s second-quarter total revenues reached $C3.63 billion, up from nearly $C3.33 billion. Operating income also increased in the first three months of 2018 to $C1.52 billion compared with $C1.41 billion in 2017. Diluted earnings per share rose to $C1.77 compared with $C1.36 in the second quarter of 2017. CN reports earnings in Canadian dollars, even though a large part of its revenues and expenses are denominated in U.S. dollars. CN’s 2017 second-quarter operating ratio was 57.5. The 2018 figure is a year-over-year improvement of 0.7 points and an increase of 9.6 points over the first quarter of 2018. The 63-year-old Ruest has been with CN for 22 years. He had been interim president and CEO since March 2018. Before that he served for eight years as its executive vice president and chief marketing officer.